"Excel for Chemists should be part of any academic library offering courses and programs in Chemistry." "I highly recommend the book; treat yourself to it; assign it to a class; give it as a gift." Chemists across all subdisciplines use Excel to record data in tabular form, but few have learned to take full advantage of the program. Featuring clear step-by-step instructions, Excel for Chemists illustrates how to use the scientific calculating power of Excel to perform a variety of chemical calculations. Including a CD-ROM for Windows, this new edition provides chemists and students with a detailed guide to using the current versions of Excel (Excel 2007 and 2010) as well as Excel 2003. 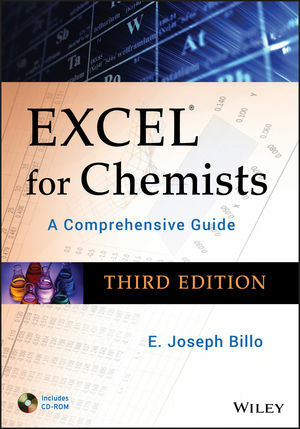 E. Joseph Billo retired in 2006 as Associate Professor of Chemistry at Boston College and is the author of Excel for Chemists: A Comprehensive Guide, Second Edition. He has presented the two-day short courses "Advanced Excel for Scientists and Engineers" and "Excel Visual Basic Macros for Scientists and Engineers" to over 2,000 scientists at corporate clients in the U.S., Canada, and Europe. Includes a CD-ROM for both Macintosh and Windows with many useful spreadsheet templates, macros, and other tools. Demonstrates step-by-step how to program Excel to perform appropriate tasks, automate repetitive data processing tasks, and prepare integrated documents by transferring data and graphics. Provides many shortcuts and tips on speeding, simplifying, and improving the use of Excel. Contains many illustrations and examples of chemical applications, including "How-to" boxes outlining details for accomplishing complex tasks in Excel. Explanations are clear and easily accessible, requiring little or no background in computer science.